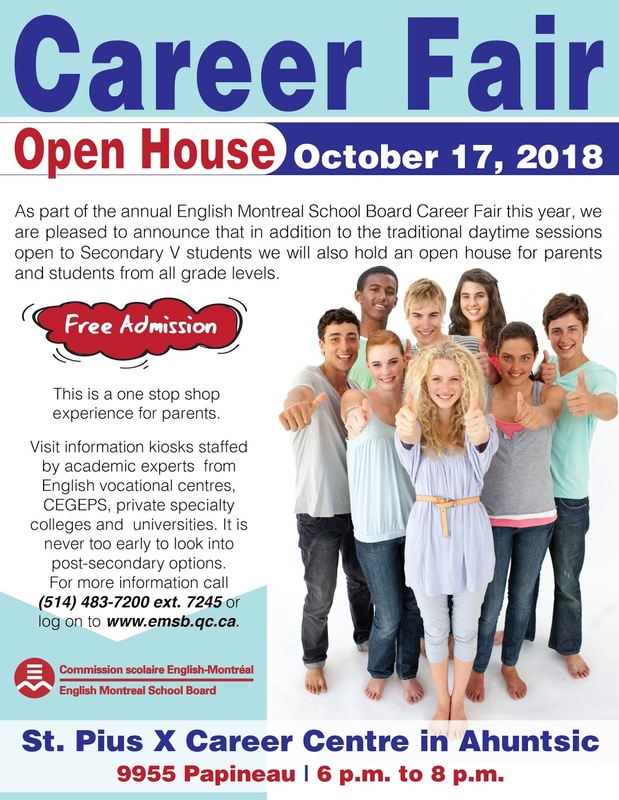 CAREER FAIR: More than 2,000 Secondary V students will attend the 18th annual English Montreal School Board (EMSB) Career Fair on Wednesday, October 17 and Thursday, October 18 at St. Pius X Career Centre in Ahuntsic (9955 Papineau). Jack Dym of Pipe and Piling Supplies Ltd. and RBC Royal Bank are the event’s title sponsors. Several on air personalities from the media will be on hand to talk to students about careers in this field and serve as guest emcees. They thus far include Catherine Verdon-Diamond from Breakfast TV, Tim Sargeant from Global TV, Christine Long from CTV and Shaun McMahon from The Beat 92.5 FM. Global TV and CBC will also be represented. Two RBC Olympic athletes will be on hand to talk to students: Jacqueline Simoneau, a two-time Pan American Gold medal winner who placed seventh in her first Olympics at the Rio 2016 Games in Synchronized Swimming (and attended Gardenview Elementary); and Sandrine Mainville, one of Canada’s most reliable relay swimmers, who won a bronze medal in Rio and a gold and silver at the 2015 Pan Am Games. From 6 p.m. to 8 p.m. on October 17, the Career Fair will be open to the community-at-large. Organizers note that this is a good opportunity for parents to attend with their children as they look towards post-secondary education options in a one-stop shopping experience. There is no charge and free parking. Harriet Cohen from EMSB Adult Education and Vocational Services is the Career Fair chairperson. The Student Services and AEVS Departments of the EMSB coordinate this program. Ms. Cohen notes that the main objective of the Career Fair is to provide students with an in-depth exposure to the various educational opportunities available to them. All students will take part in a brief general information session in the St. Pius X auditorium. Students will then have the chance to visit the various exhibition/information booths staffed by representatives from English vocational centres, CEGEPS, universities and some private business colleges. EMSB officials and special guests with students at the opening. MACKAY CENTRE INAUGURATION: After years of anticipation, a formal inauguration and ribbon cutting ceremony was held for the new $30 million dollar state-of-the-art facility for the Mackay Centre and Philip E. Layton Schools on September 25. The Mackay Centre and Philip E. Layton School staff and students are excited to have begun the new school year in their brand new facility, located at 6333 Terrebonne Avenue in NDG, between Benny and Madison Avenues. The EMSB has owned property in which the facility was built for decades. The new school building will accommodate approximately 170 students with developmental, intellectual, auditory or visual impairments as well as students with communication disorders and many other disorders or organic impairments. It is the only one of its kind to offer specialized educational and rehabilitative services for the anglophone community. EMSB Chair Angela Mancini notes that its supra-regional mandate means that students from all nine Quebec English school boards are eligible to attend this school. Daniel Hogue, who has recently retired as Director of Material Resources at the EMSB, managed the project since the groundbreaking on November 2, 2016. Principal of the Mackay and Philip E. Layton Schools Patrizia Ciccarelli has seen the project through from inception to completion, having worked hand-in-hand with the architects, Mr. Hogue, members of the EMSB’s Council of Commissioners, Director General Ann Marie Matheson and others. “It is amazing, grandiose, and I am very happy for our students and their families, for the teachers, and our rehab partners who will be working here. They deserve it,” says Ms. Ciccarelli. Kim Sullivan of Global TV, a former teacher at Mackay, was a guest emcee. Please see our full press release. Please see all of the photos here. follow the regular curriculum and learn alongside students with physical disabilities. The program boasts small class sizes, smart boards in each classroom weekly swimming and computer classes, as well as the opportunity to learn and/or play along side children who use sign language, voice synthesizers, and adapted equipment for recreation and mobility. Ms. Wainright is a well-known recording artist and the parent of a Mackay Centre School student. For the CTV Report please click here. For the CBC Report please click here. For the Global TV report please click here. For Montreal Gazette City Columnist Allison Hanes' column and accompanying video click here. NEW VICE-CHAIR: At the September 26 EMSB Council of Commissioners meeting, Joe Ortona was elected as the new vice-chairman. He succeeds Sylvia Lo Bianco, the commissioner for Montreal North and Ahuntsic. EMSB OPEN HOUSES: Open House season has begun at the EMSB primary and secondary schools. Please see www.emsbopenhouses.com for all of the dates. MENTAL HEALTH FAIR: Laurier Macdonald High School (7355 Viau) in St. Léonard will be hosting a special two-day Mental Health Fair on Tuesday, October 2 and Wednesday, October 3 (9 am to 3:30 pm), reaching out to students and parents. The East Island Network for English Language Services (REISA) is co-hosting the event for students from five other East End high schools: John Paul I in St. Léonard, Rosemount and Vincent Massey Collegiate in Rosemount, Lester B Pearson in Montreal North, and John F Kennedy in St. Michel. There will also be an evening session for parents on October 2 (7 pm), with EMSB psychologist Despina Vassiliou as the presenter. There is no admission charge. Over 1,000 students will be able to benefit from resources that will be on display. An EMSB psychologist will also be in attendance. The goal is very straight-forward: dealing with, and talking about, mental health. Among the groups taking part are the YWCA, YMCA, La Maison des Jeunes de St-Léonard and the Kids Help Line. One in five students will develop mental illness; 20 per cent of people with mental illness have a re-occurring substance abuse problem; 40 per cent of parents wouldn't tell anyone about their child's mental illness; about half of those who suffer from mental illness have never seen a doctor about it. But, 80 per cent of those who seek help are able to get back to their regular activities and live a fulfilling life. Youth intervention worker Gerry Tullio said many people are ashamed or embarrassed to reach out for help. He understands there is still a stigma surrounding mental health but that "more and more, we're trying to get rid of it. I think we've come a long way but we still have a way to go," Mr. Tullio said. For full press release click here. Please listen to our new EMSB Podcast with Barry Morgan who went to the school to interview the organizers. Jeremie Alarco, Mélodie Cohn, David Birnbaum and Yaniv Loran. QUEBEC ELECTION CAMPAIGN: EMSB students are using the present Quebec election campaign had an authentic learning experience for their own student council elections. On Wednesday, September 26 four candidates in the D’Arcy McGee riding (David Birnbaum, Liberal; Mélodie Cohn, CAQ; Yaniv Loran, Conservatives; and Jeremie Alarco, Green Party) spoke to Grades 5 and 6 students at Coronation Elementary School in Côte des Neiges . The focus was on the importance of maintaining a good image as a candidate for a political party or as a student council rep. Students will use that presentation to create their own campaigns by the end of the week. The students were extremely well prepared. Principal Tanya Alvares and her teachers found the session to be a tremendous learning experience. Yaniv Loran makes a point during an active question period. EMSB Elementary Social Studies Consultant Maureen Baron has arranged for kits from Elections Quebec for all elementary schools for a program called Voters in Training The purpose is: “Simulation that teaches how to vote.” The school component is aimed at the staff of elementary (Cycle 3) and secondary schools (general and vocational training) who want an original and dynamic way to include democratic education in their curriculum. This component offers learning activities that fit into the Quebec Education Program. The highlight of the process is organizing an election simulation in the classroom or the school while an actual provincial or municipal election campaign is going on.” The kit (ordered in English and French for each elementary school) contains lesson plans, posters, voting booth isolators, ballot boxes and interactive educational materials. See our video, with good advice for all students seeking elected office. See this coverage on CityNews. 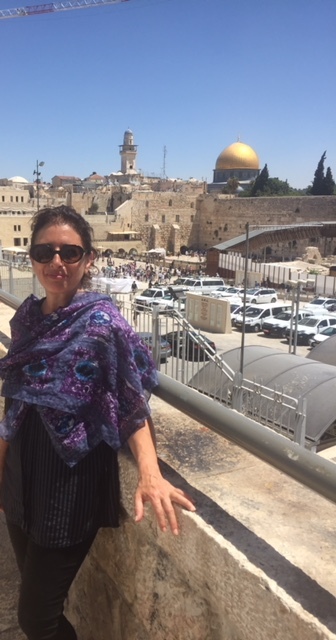 SCHOLARSHIP WINNER: The Canadian Society for Yad Vashem Scholarship Program provided Daphna Leibovici, Violence Prevention Coordinator for the EMSB, with a unique transformative learning experience that has strengthened her commitment to the promotion of Holocaust & Anti-Racism Education. She looks forward to sharing pedagogical resources on the historical context of the Holocaust and its complexities with EMSB teachers. In addition she is planning to offer a series of professional development workshops in the coming year. LUNCH AND LEARN: In what completes a well-balanced diet, Rosemount High School as well as Perspectives I and II High Schools in St. Michel will be offering students the opportunity to participate in a number of Lunch ‘N Learn sessions throughout the school year. Organized by Spiritual and Community Animator Vince Lacroce, the sessions will discuss the themes of: peace, kindness, mindfulness, healthy life choices, nutrition, anger management and relationship boundaries. During the first Lunch ‘N Learn, students learned about September 11 and heard from guest speakers: Firefighter Alessandro Piscielli from Fire House Station 54 in Kirkland, Officer Frank Tenneriello from SPVM Station 30 in St. Michel as well as Frank Caracciolo, a native of New York City who was in Manhattan on September 11, 2001. “The intent of the program was to allow our students to dialogue about what happened on 9/11, and most importantly, to understand that the actions of a few do not represent the collective,” said Mr. Lacroce. “If this workshop helps change the viewpoint of one individual, we have all done our part.” In addition to the session, students were invited to write messages of peace or create an artistic representation of peace. Their messages and artistic creations will be mailed to the United Nations and fire departments in New York City as well as fire departments in Montreal. SUBSTANCE ABUSE PREVENTION: When it comes to substance use and abuse by students, parents are often left wondering how to deal with these issues. The EMSB's Substance Abuse Prevention Consultant has some advice for parents and students. 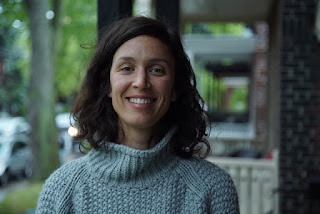 Sandrine Aschour acts as a liaison between public health agencies and the EMSB where drug and alcohol prevention is concerned. She says there is no magic wand. But the first step is to quite simply open up the line of communications. on possession and consumption of cannabis out for consultation. Listen here to our very first EMSB podcast with noted broadcaster Barry Morgan and his interview with Sandrine Aschour. Members of the Arctic meet the Honoré-Mercier reps.
ARCTIC SCHOOL TOURS RESUME: Players from the Montreal North Arctic Junior AAA hockey team resumed their tours of East End schools, stopping at Honoré Mercier Elementary in St. Leonard on September 24. The five players (including Gerald McShane and Lester B. Pearson High School grad Elio Di Meo), joined by team vice-president Lina Di Giovanni and Marketing Director Alexia Perretta, shared a stay in school message with the students, answered questions and took part in a fun scrimmage. On Wednesday night, October 10 the Arctic will host the Lac St. Louis Revolution and several hundred tickets have been distributed to Honoré-Mercier students. Alois gets a warm welcome from his friends. work and student visa, and as such they could opt for the schools of their choice. But when they became permanent residents in June, Alois and his younger brother and sister were told they would have to switch to French schools. According to Bill 101, also known as the Charter of the French Language, any immigrants to Quebec, along with Canadians whose parents were educated in French, must go to school in French. In Alois’s case, that would have meant doing his last year of high school in French, and leaving his friends — and his good marks — behind. Following a request for an exemption made to the ministry of education in June — and a story in the Montreal Gazette on Thursday — the exemption was granted, on humanitarian grounds. “I’m very happy about it,” Alois said. “It makes me feel a lot less stressed. And all my friends are really happy too — everyone was hugging me.” Here are the first and second stories. Prime Minister Trudeau and Minister Duncan view Allison's project. STUDENT MEETS PRIME MINISTER TRUDEAU: Royal West Academy Secondary IV student Allison Engo attended the Prime Minister of Canada’s Science Fair at Parliament Hill in Ottawa earlier this month. 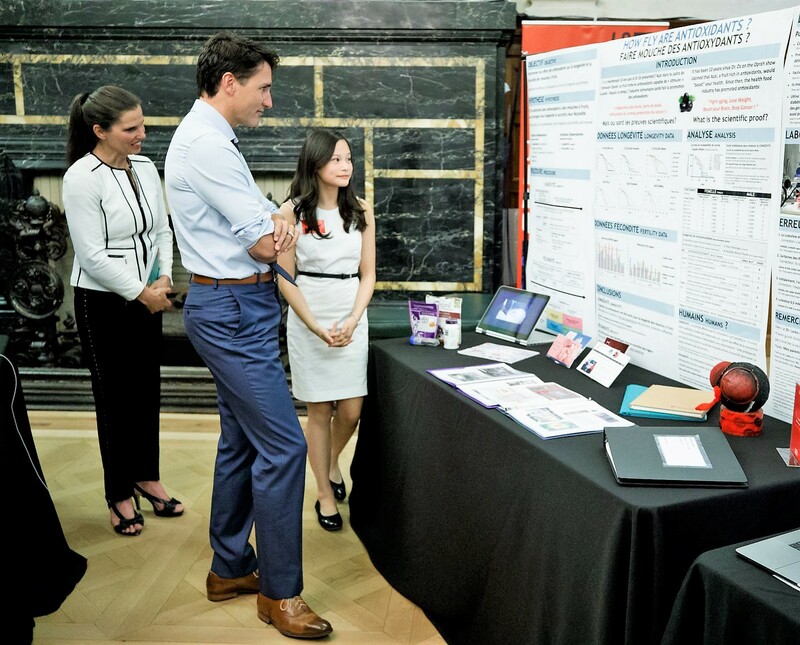 They had invited 30 young scientists from across Canada who had shown scientific innovation in health, technology, and environment. 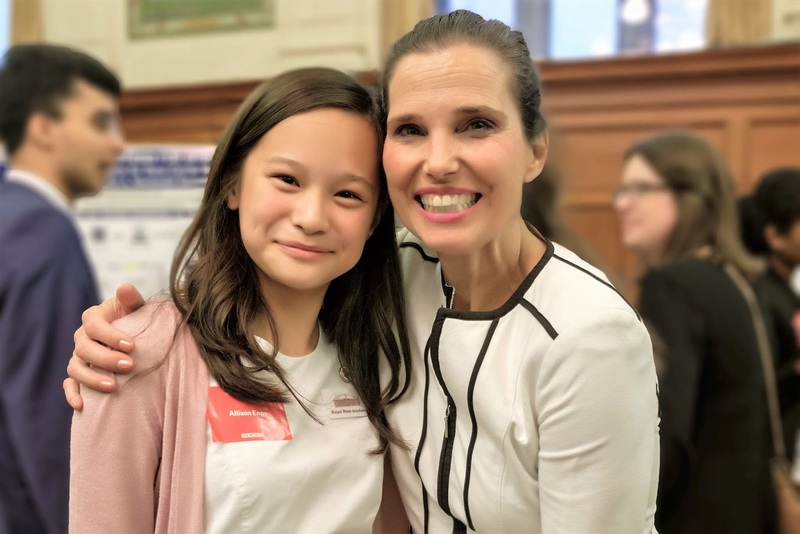 “I was thrilled to be there because I got to meet many VIPs and to reunite with many of my fellow Canada Wide Science medalist,” she said. The morning was devoted to a round table meeting with Kirsty Duncan, the Federal Minister of Science. Students took turns describing their projects and Allison said she was impressed by the breadth of innovative ideas. The spirit of discovery was certainly very strong in that room That afternoon, they setup their projects and they were visited by Members of Parliament and Senators. While Allison got to meet the likes of Ms. Duncan, Jane Philpott and Senator Grant Mitchell, the highlight of the day was when Prime Minister Justin Trudeau came to see her. “I was delighted to find out that he already knew the details of my project and he showed great interest in dietary antioxidants,” she said. “We also spent some time talking about Royal West Academy and our home town Montreal. In the end, he left with some advice, ‘Allison, expect the unexpected.’ The irony of it was that so far, 2018 was already full of unexpected events . I could not believe that I had just had a one-on-one meeting with the Prime Minister of Canada to discuss my personal interests. What an unforgettable day!" Students enthusiastically do their cleanup. 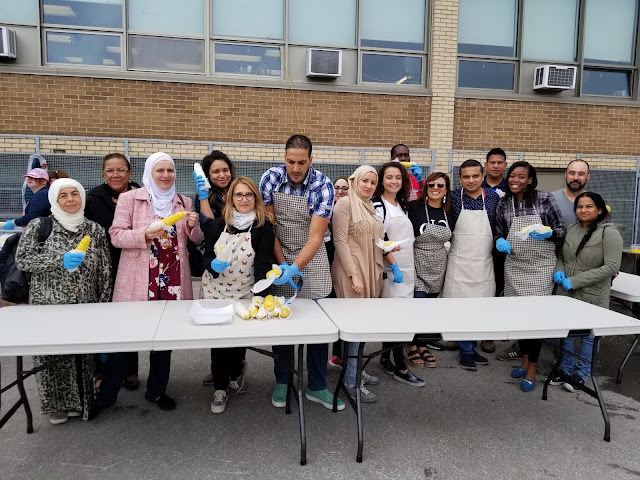 BIG CLEANUP AT JFK: For the fourth consecutive year, the The Work-Oriented Training Pathway (WOTP) program at John F. Kennedy High School in St. Michel has partnered with the City of Montreal as a member of the "Big Cleanup" initiative promoted by the city. 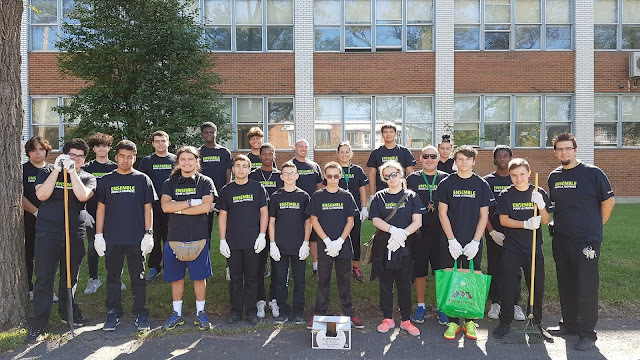 The group from JFK WOTP, led by teachers Anthony Tonin and Stefan Kazamias, cleaned the grounds of the school, the parking lot and the sidewalks around the school, making the school environment a much cleaner place. The WOTP program plans to continue their partnership with the City of Montreal in 2019. SEXUAL EDUCATION: As the EMSB prepares to launch the sexual education curriculum, here is a story that appeared in The Gazette about Lester B. Pearson High School and teacher Clorinda Antonacci. Stay tuned for more on this subject on our website. by reducing disruptive classroom behavior. Ms. Paquette said the program was launched some 20 years ago because, "teachers were having some challenges with children who had behavioral difficulties, social, emotional, in the classrooms. The program was used to support these teachers and also behaviour technicians or other staff working in school with these children in order to improve success in the classroom for these kids." The program is also used to help teachers become more successful with classroom management. Project Harbour behavior technicians assist the teacher in creating systems to help the students become organized, focused and attentive. Not all, but, some of the children Ms. Paquette and her team works with have experienced some kind of emotional and/or physical trauma. If affects them and the teacher's ability to teach." Please see the full press release. CODING EVENT: Westmount High School will be hosting an NBA sponsored “coding” event on October 9 from 1:48 p.m. to 3:06 p.m. This event is being held exclusively for the Grade 7s, and was brought in to increase excitement around the school’s brand new Robotics program. The event will mainly take place in the gym where the students will be divided into stations. The students will then participate in interactive “tabletop” coding/robotics activities, culminating in a photo opportunity with an “NBA Legend.” Also expected is a DJ performance and an appearance by the Toronto Raptors mascot. PEACE DAY: On September 18, Sinclair Laird Elementary School in Park Extension acknowledged International Peace Day with multiple initiatives. Grade. 2's taught meditation (peace of mind) to the Kindergarten and Pre-K classes. Grade 4's wrote peace and loving notes, that were delivered to the school neighborhood residents, while two Grade 4's designated as "Peace Reps" cited their peace quotes, offering peaceful wishes to the Grade 2's. This week Grade 6's will offer a simple workshop, as "peace leaders" offering solutions and advice to resolve conflict to kindergartners to Grade 4's. Spiritual Animator Caroline. Choy says "the students loved this peaceful immersion, as it made a Zen ambiance to all the students, both student teaching and student listeners. All these students were involved in the creative process of learning. 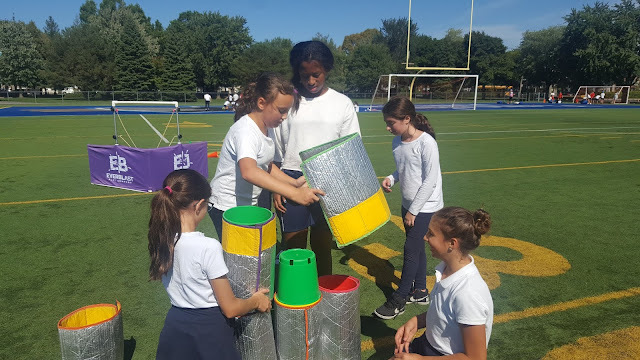 As they emanate this and carry it forward into their friendships, they become more mindful of this very value, which the school had successfully underscored that day." Students engage in the activities. 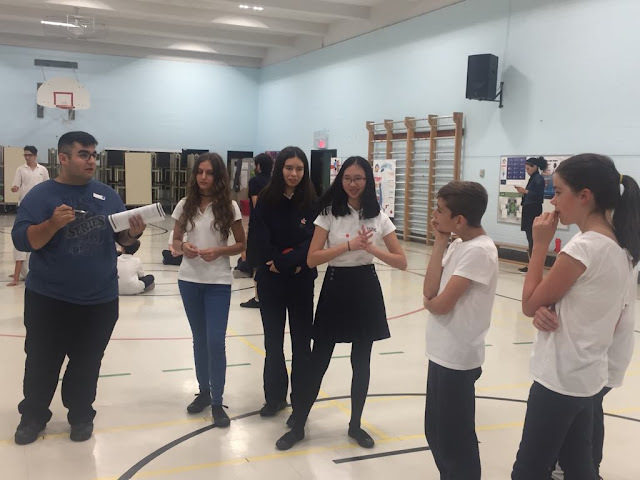 AGE APPROPRIATE GAMES: On September 21, the official UN International Day of Peace, students from Vincent Massey Collegiate (VMC) and Edward Murphy School played age-appropriate games that promoted Peace and Respect. This fun filled, hands-on workshop, co-facilitated by EMSB Base Daycare staff Jodi Schwartz, Léah Hendriks and Spiritual and Community Animator Rocco Speranza, was part of the Play It Fair (PIF) Equitas training for the VMC Secondary IV students. The community service portion of their training will take place within EMSB day cares. Students received training for the 30-week long program so they can effectively lead PIF games and discussions with elementary school children. The aim is to assist the children in understanding the value of: fairness, acceptance, inclusion, respect, cooperation, and responsibility. Mr. Speranza remarked, “Seeing the smiles and hearing the laughter made my day.” In early January, the VMC students will receive the second part of their training, how to lead the elementary students in developing a community based project. They will take on a more creative and challenging leadership role in order to guide the elementary students through the creation process. This is VMC’s fourth year participating with the Supporting Children as Leaders Through Play it Fair! Program. Our Lady of Pompei students play some games. WELCOME BACK AT POMPEI: Our Lady of Pompei Elementary School in Ahuntsic held their annual Welcome Back Party. The children enjoyed different team building games at the Parc des Hirondelles. A party lunch was offered to the students including hot-dogs, chips and ice cream. Also, under the year theme of "positive attitude towards success," each group had the mission to decorate their classroom doors. Everyone enjoyed a wonderful fun day and a big thank you goes out to parent volunteers that came and made the day a great success. FACE SOCCER: On September 24 FACE School's Juvenile Boys soccer team hosted Rosemount High School for a regularly scheduled GMAA game. FACE won 7-1. Since FACE doesn't have a home field, they have to rely on their neighbouring fields. Luckily, the boys got to play on Molson Stadium's field! The school wishes to thank the McGill Athletics department for their help in making this happen! Both teams enjoyed the opportunity and spent a beautiful fall day in downtown Montreal. Pictured with students are Simone Nichol, Garrick Tiplady managing director of Facebook and Instagram Canada, Mike Rabbat, Mido Assran AI researchers and Professor Joelle Pineau director of the AI lab here in Montreal. 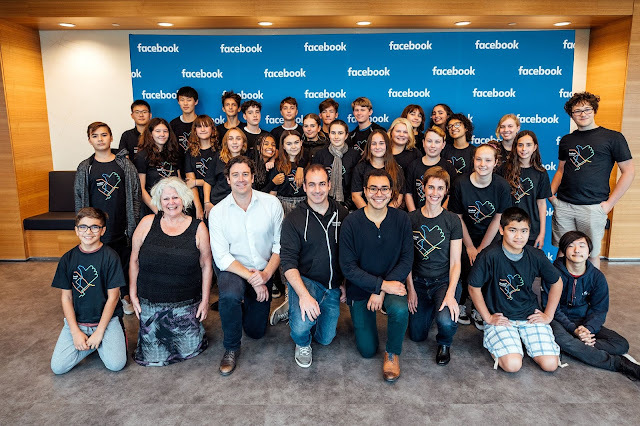 AI AT FACE: FACE School wishes to thank Dr. Joelle Pineau, Director of the Facebook AI Montreal Lab for inviting Simone Nichol and the Yr 9E to the Facebook AI Lab one year anniversary. At the Facebook AI event, the students worked with animators to learn how to code and were given a project to do. All in all, this was a truly amazing event to be part of and to meet the highly educated AI community. This is the world that the students are heading into and it is important to open this door to them so that they can engage in its development with an eye to both the advantages and to the ethics of AI on humanity. Also thanks goes to Mido Assran, who is a PHD candidate in Engineering, works at the Facebook AI lab, and leads a team of Engineers Without Borders 9E students had the experience to work with the Engineers on various real life projects that they had selected that would help improve their local community. At the end of the time with the Engineers, the students presented their ideas to a team of Consultants - Math , Science, STEAM - from the EMSB, who judged the best project. Focusing on the green initiative. B.A.S.E. CONFERENCE: Nature is right at your fingertips! 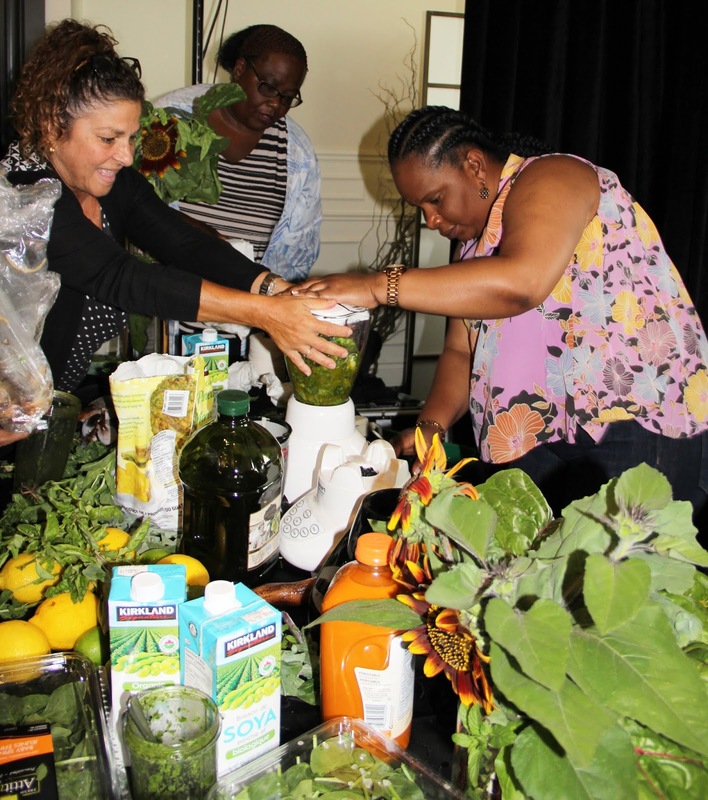 That was the main message at this year’s Annual Daycare Conference, which focused on B.A.S.E.’s Environmental Consciousness Educational Core. As some 200 daycare technicians and educators gathered at The Challenger (2525 rue des Nations) on Wednesday, August 22 they were encouraged to become actively engaged in green initiatives at their own daycares so that they and the children feel empowered to make changes that better the world. The half-day conference included three workshops: Digging Up B.A.S.E.’s Green Initiatives, NutriTower 101 and Activities Based On The Environment—all of which equipped the daycare staff with tools and resources to quickly and effectively integrate environmental activities in their day-to-day activity planning. Through B.A.S.E.’s gardens, green clubs, cooking programs and other green initiatives, children learn important life skills while gaining knowledge that helps them to become more environmentally conscious citizens. The knowledge and skills learned has a ripple effect as it is shared with parents and school community members. 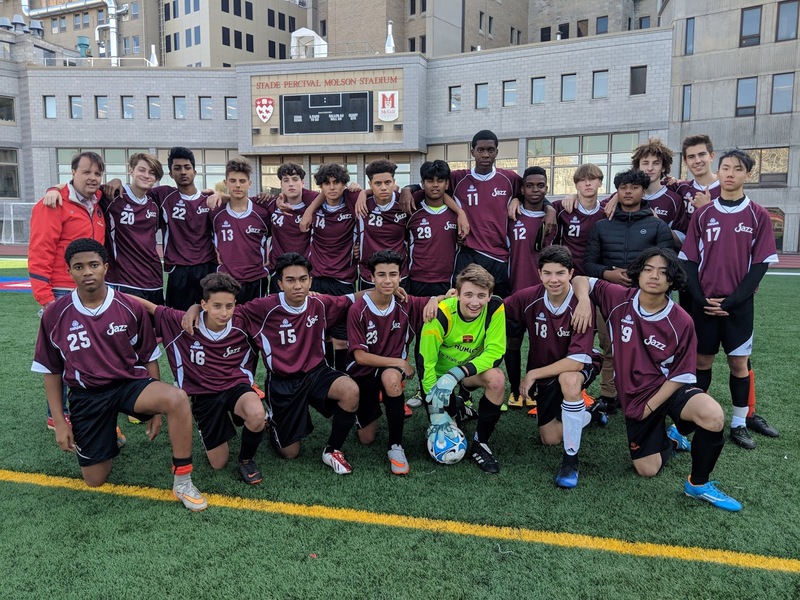 TOONIE CHALLENGE: Six EMSB schools (Merton, Gardenview, Willingdon, Roslyn, Marymount and John Paul I) participated in the recent sixth annual Toonie Challenge of the Friends of the MUHC. More than $13,000 was raised last year to purchase Kangaroo Pumps for the Neo-natal Intensive Care Unit. These pumps help premature babies to eat. This year, the Toonie Committee has drastically changed the format of the Challenge. They would like to have as many Montreal students as possible participating to raise toonies. Traditionally, there was a “kick-off” event in the fall at a school where students from the various participating schools came to hear a keynote speaker and visit various kiosks from the MUHC. The students would then go back to their schools and have until the beginning of June to raise their money. Schools did a variety of events; bake sales, dances, free dress days, etc. Due to space constraints at the host schools, they were only able to accommodate around 250 students and staff. The new format will allow the Toonie Challenge to reach as many students as possible as they will be bringing the Challenge to every participating school through a new Toonie Challenge Launch video. “As a mom myself, I realize that schools are always being targeted for fundraising,” said Chairman Tara Wright. “The Toonie Committee feels that this event is special, as we would very much like to start empowering students from elementary school to high school to make a difference. ‘Kids helping kids’ is the mantra we would like Montreal students to embrace and to take an active role, no matter how big or small, in helping to raise funds for the Montreal Children’s Hospital.” Info: tooniechallenge@friendsmuhc.org. Some of the EMSB staff who volunteered at the Montreal Families Education Fair. EMSB PRESENCE AT MONTREAL FAMILIES EDUCATION FAIR: On the afternoon of Sunday, September 23, EMSB staff met parents from across the island of Montreal at the Montreal Families Education Fair, which took place at the Holiday Inn Pointe Claire. 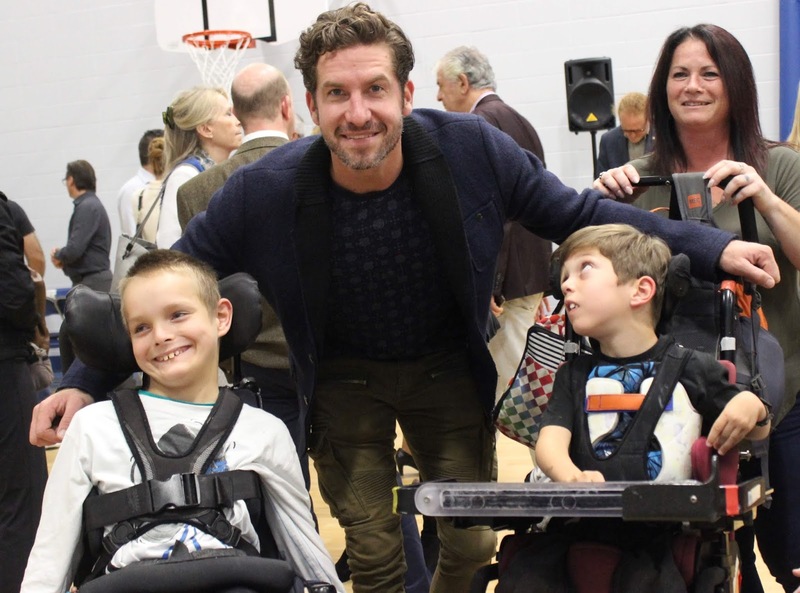 This annual event showcased two public school boards, private schools, and tutoring centres. Clad in their 20th anniversary t-shirts, the EMSB team of 19 volunteers brought their friendly, warm and welcoming enthusiasm and energy to the event. They included eight professionals from Student Services, who answered questions and advised about everything from special needs and guidance counselling to Inspirations. Experts in school administration Maria Ferrante and Natasha Gillespie were busy all afternoon informing parents on eligibility, registration and transportation. Alex Kulcyz, vice principal of LaurenHill Academy, represented his school and answered questions about EMSB high schools, and Vice Principal of Gardenview Elementary School Eugenia Carystios responded to queries about EMSB elementary schools. As always, Sara Iatauro and NAO (the robot) were a big hit with parents and students alike as they proudly shared the EMSB’s Robotics and STEAM programs. Adult Education and Vocational Services were represented by Laurier Macdonald Vocational Centre’s Hairdressing program. The team were at work early Sunday morning preparing students’ hair and make-up so that visitors could see the quality of teaching and skills learned at Laurier Mac. It was a great day for the EMSB and a big thanks to Wendy Singer for coordinating the logistics and for all of the staff who volunteered their day. 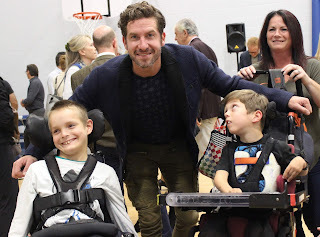 While numbers are not yet in, we estimate that over 300 families all know more about the EMSB after visiting our tables To see photos of the event, click here. 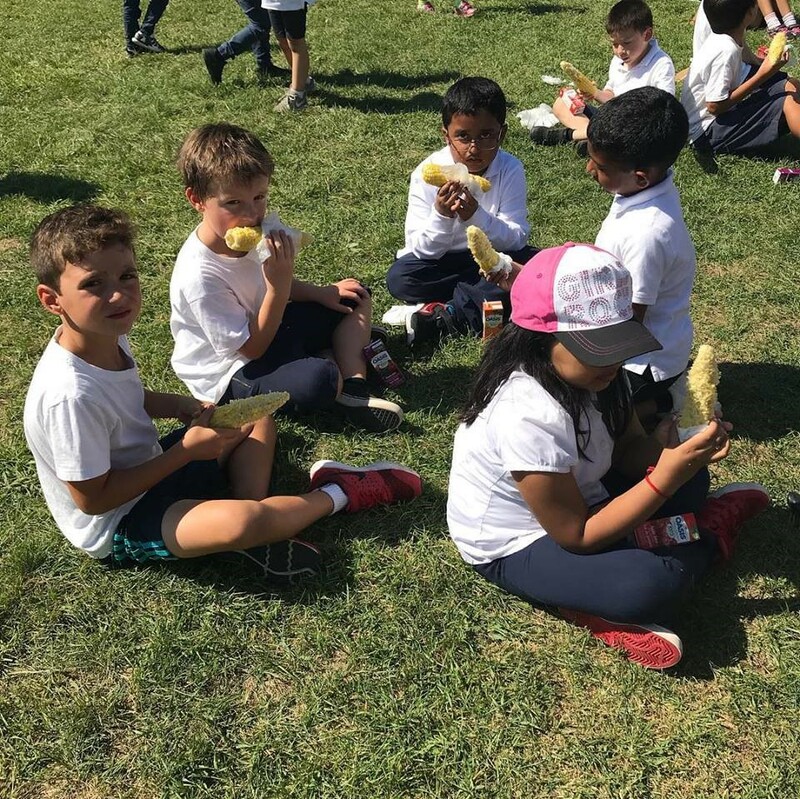 CEDARCREST FUN: Families and students from Cedarcrest Elementary School in St. Laurent enjoyed a fun filled afternoon at their annual welcome back corn roast. Families were treated to corn, music and time to socialize with teachers, parents and the Cedarcrest community. A great time was had by all! The Chorale at one of their recent appearances. 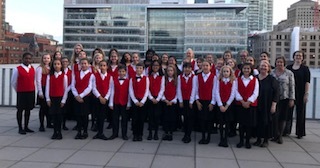 CHORALE BEGINS SEASON: The EMSB Chorale began its 39th season on September and has since welcomed 35 new members, mostly to the Junior Chorale (Grade 4-5-6 students). Upcoming activities include the choir’s annual fall music camps, a joint concert of the Senior Chorale (high school students) with a choir from FACE at the Chalet de la Montagne on November 18, a guest appearance with the Lyric Theatre Singers on December 6 at the Loyola Chapel and the choir’s own annual Holiday Concert on December 8 at Christ Church Cathedral. Auditions for the fall semester close September 29. 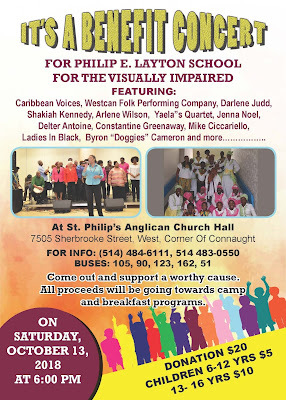 For more information, contact conductor Patricia Abbott at 514-483-7200, ext. 7234 or pabbott@emsb.qc.ca. FIRST PAGE WRITING CHALLENGE: CBC want students in Grades 7 to 11 to provide a glimpse of the great Canadian novel in the year 2168. Their challenge is to write the first page of a novel set 150 years in the future with a protagonist facing an issue that's topical today and setting the scene for how it's all playing out in a century and a half. Submissions between 300 to 400 words will be accepted online from Nov. 8 to 29. Two winners, selected by YA author Cherie Dimaline, will receive one year of OwlCrate, a book subscription service, and 50 books for their school libraries. Visit CBC.ca/thefirstpage for more information. 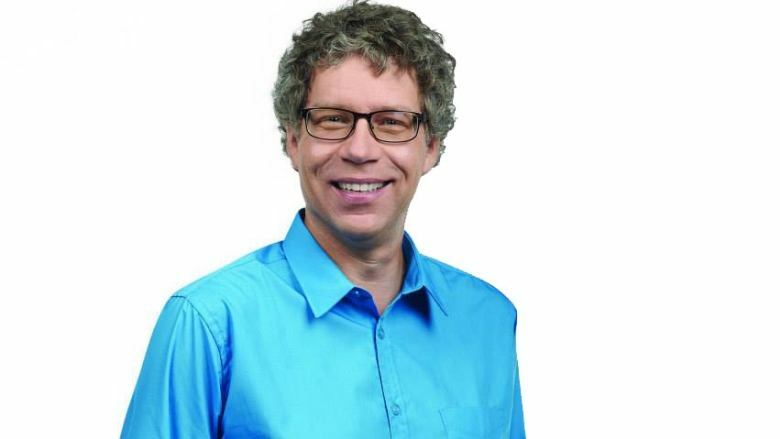 COPEMAN AT QESBA: The Quebec English School Boards Association (QESBA) is pleased to announce that the Board of Directors has unanimously named Russell Copeman, former Côte-des-Neiges/Notre-Dame-de-Grâce borough mayor and former Member of the National Assembly for Notre-Dame-de-Grâce, as their new executive director. QESBA has been without an executive director for 17 months during which time the Board of Directors embarked upon an ambitious strategic planning process. QESBA is the voice of English public education in Québec and represents 100,000 students in 340 elementary, high schools, and adult and vocational centres across Québec. BACKPACKS AND BACK HEALTH: The CIUSSSS West Central Montreal airs an interesting pod cast on different matters. It can be accessed at podcast.ciusssswestcentral.ca. The host is Montreal broadcaster Peter Anthony Holder. Here is a Back to School edition on back packs. RHS REUNION: It has been 35 years since the Rosemount High School Class of 1983 graduated and a reunion is planned for Saturday October 13 (6 pm ) to reconnect, reminisce and have a great evening with old friends and beloved teachers. Proceeds will go to the RSH music program. See their Facebook event. Info: info:pcolapelle@sympatico.ca, jrot66@hotmail.com, maria.ditomasso@douglas.mcgill.ca. Tickets are $50 and not available at the door. PAGE PROGRAM: Each year, 40 students graduating from high schools and CEGEPs are selected from across Canada to participate in the House of Commons Page Program during their first year of full-time studies at one of the four universities in the National Capital Region. Pages work directly on the floor of the House of Commons and are responsible for a wide range of tasks related to Chamber activities. This provides them with the opportunity to broaden their knowledge of Parliament by playing a role in the rich traditions of the Canadian parliamentary system. The recruitment campaign for the 2018-2019 academic year will take place from October 1 to December 3, 2018. For any questions about the House of Commons Page Program or the recruitment campaign, please do not hesitate to contact us at (613) 992-7032 or at PageProg@parl.gc.ca. EMPOWERMENT: Encounters with Canada has once again partnered with LEARN Quebec to give students ages 14-17* who attend English schools in Quebec, the opportunity to participate in the Empowerment: Compassion in Action Contest. Twelve (12) winners will attend Encounters with Canada in Ottawa during the 2018-2019 school year, compliments of LEARN. Each prize is valued at $750. Winners will choose from among 15 different themes and will spend an unforgettable week with 140 students from across the country. An array of engaging workshops, speakers, excursions, social and cultural activities will be offered to participants. They also explore career options related to the theme of their choice. The contest invites students to enter individually or in pairs and gives them the option to submit an essay, article, poem, drawing, painting, poster, or video about an individual or group who has inspired them personally through their compassion and leadership to make the community a better place Deadline is Fri. October 12. (See attached revised contest flyer.) For complete contest rules and guidelines, and to download the entry form, visit the LEARN website at www.learnquebec.ca/empowerment. OLD PORT VISIT: On September 7, 90 students from Galileo Adult Education Centre in Montreal North visited Montreal’s City Hall at the old port. Students took part in a guided tour and learned about the history of the Montreal government. With the upcoming Quebec election in October, students had the opportunity to tour the hall of honour and the council chambers, learn about the monthly meetings held by city officials and see the mayor’s gallery. This enriching experience also offered students the chance to view more than 150 works of art, sculptures, prints, paintings, tapestries and drawings on display as part of the Municipal Art Collection. Galileo students were excited that they were able to connect their English and French language lessons learned in class to the tour guide’s detailed description of Montreal City Hall’s past accomplishments. Galileo students celebrate a return to classes. 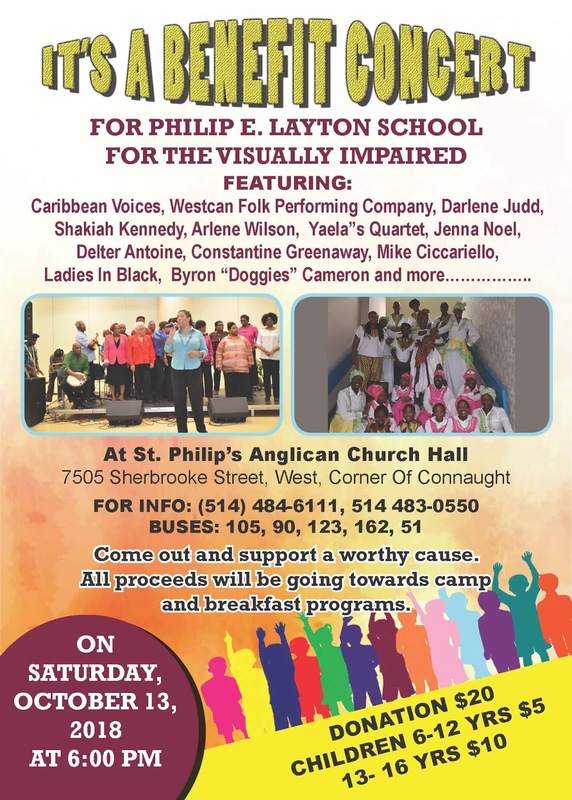 CONCERT AT WAGAR: Tickets are selling fast for a much anticipated benefit concert on Tuesday, October 9 (7:30 pm) at the Wagar Adult Education Centre on Parkhaven Avenue which will feature the world-class Musicians of the World Symphony Orchestra for the unheard of low price of $15. 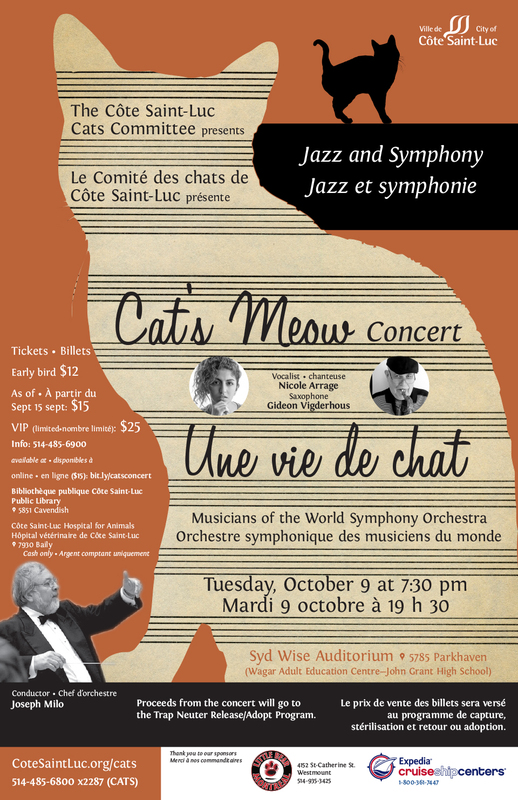 Proceeds will go towards the Trap, Neuter, Release and Adopt Program of the Côte Saint-Luc Cats Committee. A limited supply of $25 VIP seats are available via mcohen @emsb.qc.ca only. Otherwise please go to the CSL Public Library on Cavendish Boulevard. The date was moved to October to avoid the traditional August heat. Please click on this link below for all of the details..
PORTES OUVERTES À LA CSEM : La saison des portes ouvertes est en branle dans les écoles primaires et secondaires de la CSEM. Visitez le www.emsbopenhouses.com pour connaître les dates. FOIRE DES CARRIÈRES: Plus de 2 000 élèves de la 5e secondaire prendront part à la 18e édition annuelle de la Foire des carrières de la Commission scolaire English-Montréal (CSEM) le mercredi 17 octobre et le jeudi 18 octobre au Centre de carrières St. Pius X situé au 9955, avenue Papineau à Ahuntsic. Jack Dym de Pipe and Piling Supplies Ltd. et la Banque Royale RBC sont les commanditaires en titre de cet événement. Plusieurs personnalités des médias seront sur place pour renseigner les élèves sur les carrières dans ce domaine et agiront à titre de maîtres de cérémonie. Il s’agit notamment d’Eramelinda Bouquer de CJAD, Catherine Verdon-Diamond de Breakfast TV, Christine Long de CTV et Shaun McMahon de The Beat 92.5 FM. Global TV et CBC seront également représentés lors de cette activité. Deux athlètes olympiques du programme RBC s’entretiendront avec les élèves : Jacqueline Simoneau, double médaillée d’or des Jeux panaméricains qui s’est classée au 7e rang lors de ses premiers Jeux olympiques à Rio en 2016 en nage synchronisée, et Sandrine Mainville, l’une des meilleures nageuses en relais ayant remporté une médaille de bronze à Rio ainsi que l’or et l’argent aux Jeux panaméricains en 2015. La Foire des carrières sera ouverte au grand public le 17 octobre, de 18 h à 20 h. Les organisateurs tiennent à souligner qu’il s’agit là d’une excellente occasion pour parents et élèves de se renseigner sur les options postsecondaires qui s’offrent à eux. L’admission et le stationnement sont gratuits. Harriet Cohen des Services de l’éducation des adultes et de la formation professionnelle (SEAFP) préside le comité de la Foire des carrières. Les Services aux élèves et les SEAFP de la CSEM coordonnent ce programme. Mme Cohen souligne que l’objectif principal de la Foire des carrières vise à sensibiliser les élèves aux divers programmes d’enseignement qui s’offrent à eux. Tous les élèves assisteront à une brève séance d’information générale dans l’auditorium du Centre de carrières St. Pius X. Ils auront ensuite l’occasion de visiter les divers kiosques d’information/d’exposition et de s’entretenir avec des représentants des centres de formation professionnelle, des cégeps, universités et de certains collèges privés. SEMAINE CONTRE L’INTIMIDATION: La semaine contre l’intimidation et la violence dans les écoles se tiendra du 1er au 5 octobre. Restez à l’affût pour connaître la programmation des activités à venir. FOIRE SUR LA SANTÉ MENTALE: L’école secondaire Laurier Macdonald située au 7355, boul. Viau à Saint-Léonard organisera une foire de deux jours portant sur la santé mentale, les mardi et mercredi 2 et 3 octobre, de 9 h 00 à 15 h 30. Le Réseau de l’est de l’île pour les services en anglais (REISA) est co organisateur de l’événement pour le compte des élèves de cinq autres écoles secondaires de l’est de l’île : John Paul I à Saint-Léonard, Rosemont et le Collège Vincent Massey à Rosemont, Lester B. Pearson à Montréal-Nord, et John F. Kennedy à Saint-Michel. Une séance en soirée destinée aux parents et animée par Despina Vassiliou, psychologue à la CSEM, est également prévue le 2 octobre, à 19 h. L’admission est gratuite. Plus de 1 000 élèves pourront bénéficier des ressources qui y seront présentées. Un psychologue de la CSEM sera également sur place. L’objectif vise à apprivoiser la santé mentale et en parler. Figurent parmi les organismes participants : le YWCA, le YMCA, la Maison des jeunes de Saint-Léonard et Jeunesse, J’écoute. Un élève sur cinq développera des problèmes de santé mentale; 20 pour cent des personnes atteintes de troubles mentaux sont également aux prises avec un problème de toxicomanie récurrent; 40 pour cent des parents n’en parleraient à personne si leur enfant souffrait d’une maladie mentale; environ la moitié des personnes qui souffrent d’un trouble de santé mentale n’en ont jamais discuté avec un médecin. Or, 80 % de ceux qui vont chercher de l’aide sont en mesure de reprendre leurs activités régulières et de vivre une vie pleinement satisfaisante. Gerry Tullio, intervenant auprès des jeunes, a indiqué que plusieurs éprouvent de la honte ou de l’embarras à demander de l’aide. Il reconnaît qu’il existe encore des préjugés entourant la santé mentale mais que « de plus en plus, on cherche à les éliminer. Nous avons fait beaucoup de progrès, mais il reste encore beaucoup de chemin à faire », a déclaré M. Tullio. CAMPAGNE ÉLECTORALE AU QUÉBEC: La conseillère en sciences sociales au primaire Maureen Baron a obtenu pour toutes les écoles primaires des trousses auprès d’Élections Québec dans le cadre d’un programme intitulé « Électeurs en herbe » (https://www.electionsquebec.qc.ca/english/teacher-student/voters-in-training-in-a-nutshell.php#bandeau-zed). Par l’entremise de simulations, ce programme a pour but d’initier les jeunes à la démocratie. Le volet pédagogique s’adresse au personnel des écoles primaires (3e cycle) et des écoles secondaires (formation générale et formation professionnelle) en quête d’une méthode originale et dynamique d’intégrer l’éducation à la démocratie à leur curriculum. Cette composante propose des activités d’apprentissage qui cadrent avec le programme de formation de l’école québécoise. Le processus vise à organiser une simulation électorale dans la classe ou dans l’école à l’occasion d’une élection provinciale ou municipale. (https://www.electionsquebec.qc.ca/english/teacher-student/voters-in-training-in-a-nutshell.php#chevron1). La trousse (commandée en anglais et en français pour chacune des écoles primaires) renferme des plans de leçons, des affiches, des isoloirs, des boîtes de scrutin ainsi que du matériel pédagogique interactif. RÉCIPIENDAIRE D’UNE BOURSE D’ÉTUDES : Dans le cadre du programme de bourses d’études de la Canadian Society for Yad Vashem, Daphna Leibovici a pu vivre une expérience d’apprentissage unique et transformatrice, consolidant par le fait même son engagement envers la promotion de l’enseignement de l’Holocauste et de l’antisémitisme. Elle est impatiente de partager avec les enseignants de la CSEM les ressources pédagogiques en lien avec le contexte historique de l’Holocauste et toutes ses complexités. Qui plus est, elle compte offrir une série d’ateliers de perfectionnement professionnel au cours de l’année à venir. CENTRE MACKAY: Au terme de plusieurs années d’attente, une cérémonie officielle d’inauguration a eu lieu le 25 septembre en l’honneur du nouveau bâtiment ultramoderne construit au coût de 30 millions de dollars qui abrite le Centre Mackay et l’École Philip E. Layton. C’est avec un grand enthousiasme que le personnel et les élèves du Centre Mackay et de l’École Philip E. Layton ont entamé la nouvelle année scolaire dans leurs toutes nouvelles installations situées au 6333, rue de Terrebonne à NDG, entre les avenues Benny et Madison. Depuis des décennies, la Commission scolaire English-Montréal (CSEM) était propriétaire du terrain sur lequel le bâtiment a été érigé. Le nouveau bâtiment accueillera quelque 170 élèves ayant des troubles du développement, ou une déficience visuelle, auditive ou intellectuelle, de même que des élèves qui éprouvent des troubles de communication ou autres, ou encore des déficiences organiques. Il s’agit du seul établissement du genre à offrir des services éducatifs spécialisés et de réadaptation à la communauté anglophone. Compte tenu de son mandat suprarégional, tous les élèves des neuf commissions scolaires anglophones du Québec y auront accès. D’une superficie totale de 9 454 mètres carrés, le bâtiment a été soigneusement conçu pour répondre aux besoins divers de son effectif scolaire. L’école est entièrement accessible. Elle est dotée de quatre ascenseurs et d’une rampe qui relie le rez-de-chaussée à l’étage supérieur. Les espaces sont très lumineux grâce aux fenêtres qui s’étendent du sol jusqu’au plafond et qui laissent pénétrer la lumière du jour. Daniel Hogue, ex-directeur du Service des ressources matérielles de la CSEM et maintenant à la retraite, a géré le projet depuis la première pelletée de terre le 2 novembre 2016. Patrizia Ciccarelli, directrice du Centre Mackay et de l’École Philip E. Layton, a pris part au projet du début à la fin, collaborant de près avec les architectes, M. Hogue, les membres du conseil des commissaires de la CSEM, la directrice générale Ann Marie Matheson et d’autres personnes ayant participé au projet. « Le résultat est extraordinaire, grandiose, et je suis tellement heureuse pour nos élèves et leur famille, les enseignants et nos partenaires en réadaptation qui travailleront ici même. Voilà qui est grandement mérité! », a déclaré Mme Ciccarelli. Nous vous invitons à consulter l’intégral du communiqué. CONCOURS DE RÉDACTION: CBC Books invite les élèves de la 7e à la 11e année à brosser un portrait de la littérature canadienne en l’an 2168. Le défi consiste à rédiger la première page d’un roman imaginaire dans lequel l’histoire se déroule en l’an 2168 et où le protagoniste fait face à un problème qui est d’actualité aujourd’hui. La première page devra mettre l’histoire en contexte afin de présenter l’angle sous lequel le problème sera abordé dans un siècle et demi. La période de soumission en ligne s’échelonnera du 8 au 29 novembre. Les élèves devront présenter la première page de leur roman (300 à 400 mots). Deux gagnants sélectionnés par Cherie Dimaline, écrivaine de romans pour jeunes adultes, recevront un abonnement d’un an à OwlCrate, un service de coffrets littéraires, en plus de 50 livres gratuits qui seront remis à la bibliothèque de leur école respective. Pour de plus amples renseignements, visitez CBC.ca/thefirstpage. VISITE AU VIEUX-PORT: Le 7 septembre, 90 élèves du Centre d’éducation des adultes Galileo à Montréal-Nord ont visité l’hôtel de ville de Montréal dans le Vieux-Port. Ils ont pris part à une excursion guidée et se sont familiarisés avec l’histoire politique montréalaise. À l’aube des élections qui se tiendront au Québec en octobre, les élèves ont pu faire la tournée du hall d’honneur et de la salle du conseil, se renseigner sur les séances mensuelles des élus municipaux et découvrir la galerie des maires. Cette expérience enrichissante a également permis aux élèves d’admirer plus de 150 œuvres d’art, sculptures, livres, tableaux, tapisseries et dessins exposés dans le cadre de la Collection municipale d’œuvres d’art. Les élèves de Galileo étaient heureux de voir que les connaissances linguistiques acquises dans les cours de français et d’anglais leur ont permis de bien comprendre les descriptions détaillées présentées par le guide au sujet des réalisations antérieures de l’hôtel de ville de Montréal.